With the upcoming National Dog Bite Prevention Week from May 19-25, 2013, we thought this might be a good time to discuss the medical treatments associated with dog bites and dog bite scars. According to the American Veterinary Medical Association (AVMA), there are more than 72 million pet dogs in the U.S. While not all dogs bite, they are capable of attacking, breaking the skin and drawing blood. Bites that puncture the lower dermis layer of the skin can result in scars. According to the Centers for Disease Control (CDC), there are 4.7 million Americans bitten by dogs each year. One-fifth of all dog bites require medical attention. The most recent statistics from the American Society of Plastic Surgeons show that more than 29,000 reconstructive surgeries related to dog bites are performed annually. Dog bites can cause severe lacerations, which can result in disfigurement, infections and scars. The most common severe dog bite is to the face. The wounds usually have jagged edges and uneven depths, causing scarring that is thick and uneven in places. There are different types of injuries resulting from dog bites and attacks, from small puncture wounds to simple cuts to large areas of skin, nerve, bone and tissue damage. 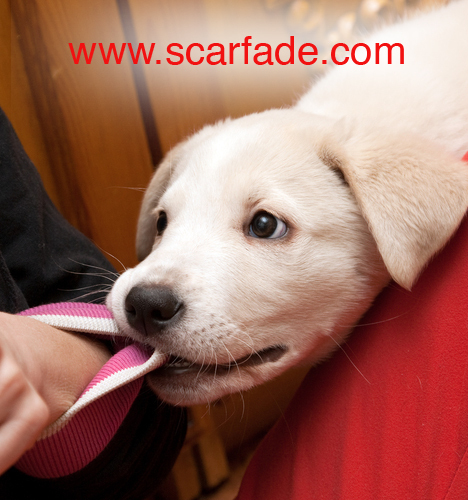 Once the bite is cleaned, the doctor may need to perform surgery or suture the wound closed to minimize scarring. Special surgical techniques are used on the face to prevent wide and jagged scarring when possible. Depending on the severity and thickness of the scar, the bite area may require multiple surgeries to allow for the smallest scar formation possible. After the scar has formed, plastic surgeons may perform dermabrasion or scar revision surgery to smooth out the surface. Once healing has begun, scar massage is a common recommendation by doctors. This prevents a lack of skin elasticity and mobility sometimes associated with facial scars. Silicone scar gel can also minimize the appearance of dog bite scars. It can be applied after the wound has healed and is worn with make-up to minimize the effects of facial scars until the scar fades away.